Back to Baltimore for this Top 200 Photo. 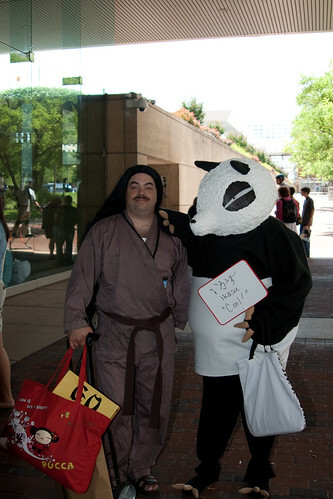 Another photo from Otakon. I was especially happy to see these guys at Otakon. Ranma ½ was the first anime I ever saw. It was my entry into the whole genre. I remember discovering it at a video rental store in Tualatin, OR. They had some VHS tapes of Seasons 2 and 3. I remember being so psyched that there were cartoons that weren’t for kids. I couldn’t wait for them to get the next tape. I spent all my time in the library at school researching Ranma and learning about the story and getting into fan fiction for the first time. If I’d been born about a decade later I probably would have really gotten into the whole fan-sub scene. Bandwidth was just too small back in those days.